Does your life ever feel too ordinary? Have your friends nicknamed you Lame Bad Person With A Routine? If so, put a spin on the norm, bust up your routine, and try these methods for adding a bit of zest to your life. 1. Shower, get dressed, eat cereal. Shower, get dressed, eat cereal. Your morning routine is the height of mundanity. Spice that up! Hire someone to come by your home first thing in the morning to open up a basket of angry cobras and empty them out in a random new location. Talk about some pizzazz! 2. If anything needs a little zip added, it’s grocery shopping. All it takes is adding a sense of urgency, and the only way to do that is by sitting inside the cart, dropping a few thousand dollars to hire a professional jockey, and allowing him to rush you through the aisles. 3. Sitting at the bus stop until your bus pulls in is flabbergastingly dull, but not if you repeat the word “bus” out loud until it loses all meaning to you. You never know—this nifty trick might even help you make new friends! 4. Oh, man, time to take out the garbage. Bo-ring. You need a change, so pick out one item from the trash and develop a deep personal connection with it. Hold it and tell it how much you’ll miss it. When it comes time to throw everything away, you can either hold onto your new companion or set it free; do whatever feels right. Either way, know that you just turned a bland garbage day into an emotional roller-coaster ride chock full of intrigue. 5. Sorting out your taxes is as boring as life gets, but what about sorting taxes in your living room after divorcing your whole home from the laws of gravity and having the crew of the International Space Station floating through it at all times? Suddenly pretty exciting, no?! 6. Stuck in another tedious work meeting? Make it fun by drawing detailed portraits of all 47 vice presidents of the United States. The meeting will be over before you hit John Nance Garner! 7. 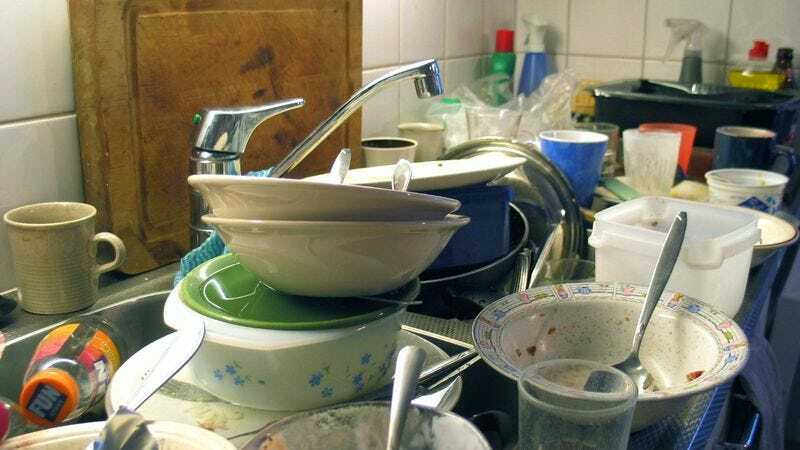 Everyone hates doing the dishes, but you don’t have to: Put some spark into it by traveling to an alternate reality in which dish soap produces 16 times as many bubbles. Wow!